The spinal disc is composed of two general parts, the tough fibrous outer layer and a soft gelatine-like inner core. When the outer layer weakens (due to any number of reasons) the inner core leaks along with bone or other tissues. You could think of a herniated disc as a tire blow out. When this occurs the leaking materials put pressure on the nearby nerve tissue and causes pain. Though not entirely accurate, herniated discs are also referred to as prolapsed discs. In a majority of cases the herniated disc pain can be treated using non-surgical methods. This includes continuing to perform normal activities and the use of pain medications. In those cases where the pain is chronic and the non-surgical treatments are not effective then herniated disc surgery would be considered. Herniated disc surgery is also known as a discectomy. The patient is admitted to a hospital and undergoes the same general preparations for any other type of surgery. The surgeon will expose the damaged disc and remove the part which has leaked. The result is a release of pressure on the nearby nerve and thus the pain. After release from the hospital the patient begins a rehabilitation programme to get them back quickly to normal activities. This may include the use of pain medications, massage, exercise, or other forms of physical therapy. 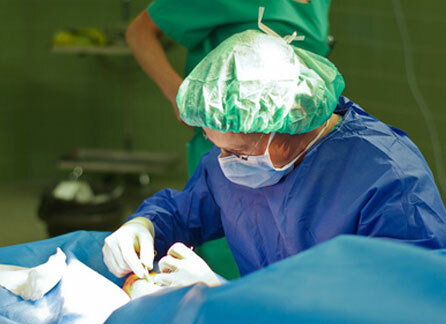 A patient undergoing herniated disc surgery is given a general anaesthetic. The surgeon will make an incision over the region of the damaged disc. The surgeon then cuts through and/or moves aside the layers of muscle and tissue until the damaged disc is exposed. Once exposed the surgeon removes the herniated portion of the disc. The patient is sewn up and sent to the recovery room for 1-2 days. It is a very invasive procedure. Over the past few years a new technique has been developed and accepted called endoscopic spinal surgery. The NHS still considers this an experimental procedure so it is only available through private hospitals however it is far less invasive and therefore less risk to the patient. The surgeon only needs to make an incision large enough for a tube about the size of a pencil. The tube is guided to the damaged disc using a fluoroscope. Thus muscle and tissue does not have to be cut like in the traditional invasive procedure. Once inserted the surgeon is able to use special instruments incorporating a light source, video camera, and tools to locate and remove the herniated material. Once the procedure is completed, only a stitch or two is needed to close the incision. The patient is able to resume normal activities usually within a day. A patient who chooses to use NHS will follow their standard hospitalisation procedures. If a patient chooses to use a private hospital, they will need to make the appropriate financial arrangements. Herniated disc surgery can cost anywhere in the range of £5,000 to £10,000 or more. The actual cost will be determined by the procedure used, hospital stay, and other related costs. Patients should also check to ensure their medical insurance will cover the procedure (most do) to reduce their out-of-pocket expenses. A person suffering from prolonged or chronic back pain should consult with their GP and exhaust all non-surgical treatments prior to considering surgery. Working with their GP and a reputable medical consultant a person should decide which procedure to use and whether to use NHS or a private hospital. They should also understand the risks and the recovery process.